side note: texture from Shadowhouse Creations. action from Coffee Shop Rita. What and adorable picture! The book was an awesome idea and the angle makes it all the more interesting. I love Dr. Seuss too!! Great idea for a picture - a yellow book! I love pictures with books. Oh so sweet!!! Love your "Yellow"!!!!! I love the depth of field and the cute toes! Fun angle - you are ready for the bare feet challenge too! fun picture! i love it! what a sweet photo - fantastic capture! We are big Seuss fans too! Love the angle of the photo and the overall feel to it. What a beautiful photograph... I LOVE the angle, and the focus on their little toes. This is just gorgeous! This is absolutley adorable! 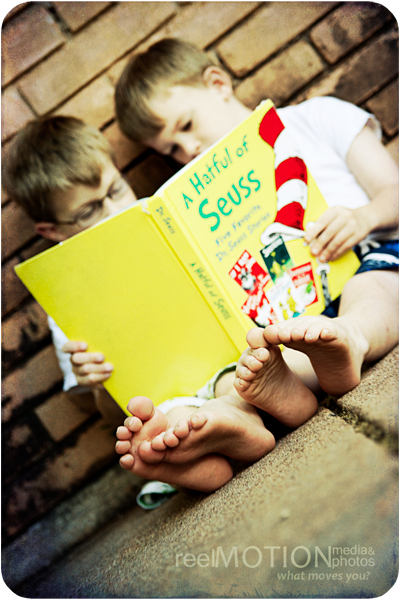 I love everything about from the angle/composition, to the book, right down to those adorable toes! Great shot! This is so cute! I love that their feet are in focus!! Great photo! oh my goodness... i LOVE this! Love this! I'm a reading specialist and a photographer and I this speaks to me on so many levels! Love it! Love their bare feet. Very creative! Awww such a sweet shot! Love the focus on the little feet. This Is so sweet I love it! Looks like it belongs on your local library wall. Love it! What a great idea to use the book! my goodness, the TOES! what is it about kid feet?!?!? super cute!! congrats on being picked as a fav!! YAY, your awesome pic made "favorite"! So excited for you, my friend. ps- I am thinking about getting a better camera [right now i have a point and shoot]- what kind do you use?